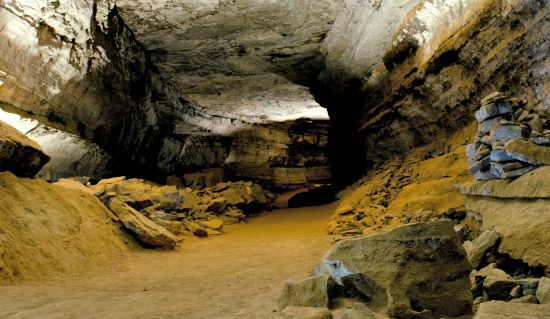 Mammoth cave is the largest connected cave system in the world by far, with close to 400 miles of surveyed passage ways and caverns. The cave system is over twice as large as the second biggest in the world and is still constantly being explored, adding several miles of newly found passages each year. The actual system was formed over 300 million years ago and the majority of the passages are made from a limestone strata covered in a layer of sandstone, which makes them remarkably stable. There is evidence that humans have used the caves for at least 6000 years, as many bones and artifacts have been found here. There is even a number of bodies still in the caves in the more secret areas which have now been sealed off. They were the bodies of native Americans who were buried here and later removed from the caves for archeological reason, though due to pressure from Native American groups they have now all been put back. The caves are open to the public and 2 different tours are held which go a good depth into the system, though special permission is needed if you wish to venture deeper than the general public normally go. The cave is thought to be home to a huge number of spirits, with the majority of them being that of native Americans. Though the 2 most well known ghosts here are those of people who were unfortunate enough to get involved in mining accidents. The first is a spirit who has been nick-named "lost John". He was a pre-Columbian miner who was working in a tunnel one day and disturbed some rock supporting the tunnels ceiling, which led to a large boulder falling on him, killing him instantly. He was found in 1935 and was placed in a glass coffin an put on exhibition. This carried on until the 1970's when he was returned to the cave and sealed into a chamber after requested from the Native American population. His apparition has been seen standing next to the seal of the chamber where he's buried, searching across the rock as if trying to find a way through, though it is not known what would happen if he were approached, as no one has yet been brave enough to do so. The next spirit is that of a man named Floyd Collins, who was involved in a cave-in but managed to escape the main fall of it, however he was trapped on the wrong side of the debris with a boulder crushing his leg. He was soon found but the amount of fallen rock in the tunnel could not be easily moved. This all happened on the 30th January, 1925 and the very next day became local news, then a couple of days later it was a huge media sensation across the whole country, with a sizeable rescue attempt put into place to recover him. The rescuers were able to get a small bag to him by poking it through a thin passage, which allowed him to eat and drink but did nothing for his crushed leg. The rescue attempt went on for 2 whole weeks but then Floyd stopped responding to the rescue team, and assumed dead the attempt was called off, with only 3 more days until they would have reached him. His spirit haunts what is today known as the "sand cave" and has scared many a visitor. He has never actually been seen but likes to make himself known by calling for help of creating the soft sound of sobbing coming from the dark corners of the cave. There is even a story of one caver who was pot-holing through the system near where Floyd died when she tripped and started to fall towards a ledge, only to have a hand grab her arm and pull her away, possibly saving her life, but when she turned to thank her caving partner there was no one to be seen.